Crispy corn tortillas, without deep frying? That’s what we’ve done here, and it makes these crunchy black bean tacos something you’ll want to try again and again! You’ll top everything with a fresh, new salsa, where buttery bites of avocado pair perfectly with the tropical flavor of fresh mango. Halve the avocado, remove the pit, and dice the flesh. Peel the mango, carefully slice the flesh off the seed, and then dice half. Chop just half the cilantro. In a medium bowl, combine the chopped cilantro, diced avocado, diced mango, and juice from half the lime. Add a pinch of salt and stir the mango avocado salsa to combine. Peel the garlic. Halve the jalapeno and remove the seeds. To a blender, add the remaining mango, cilantro, lime juice, 1 garlic clove, half of the jalapeño, 1 tbsp olive oil, and 1 tbsp water. Blend cilantro sauce until smooth, taste, and season with salt. Mince the remaining garlic and jalapeño. Drain and rinse the black beans. Place a large nonstick skillet over medium heat with 2 tsp olive oil. Add the minced garlic, minced jalapeño, and cumin, and cook until fragrant, about 1 minute. Add the black beans and a pinch of salt and mash with the back of a fork. Add ½ cup water and cook until beans have thickened, about 2 to 3 minutes. Transfer the black beans to a bowl. Rinse and dry the skillet and return to medium-high heat with 1 tbsp olive oil. Add 3 tortillas to the skillet in a single layer. Spoon 2 tbsp black beans onto one side of each tortilla and fold in half. Cook until crispy, about 1 minute per side. Repeat with the remaining tortillas. Sprinkle crispy tacos with chili powder and salt. In a medium bowl, toss the red cabbage with just half of the cilantro sauce and a pinch of salt. 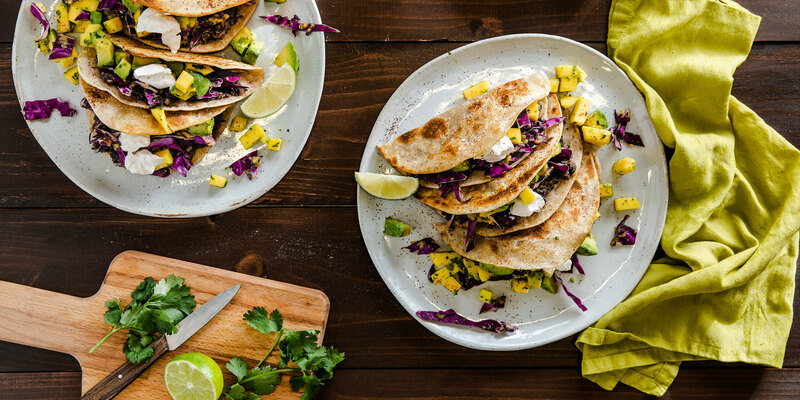 Fill black bean tacos with dressed red cabbage, mango avocado salsa, and dollop with sour cream. Olé! Sorry, we can only accommodate up to six meals. Please unselect another one first.